Dal ki dulhan or dal pithi was our favourite one pot meal during growing up years. The fun shapes of the whole wheat dumplings probably made it more enjoyable I guess. 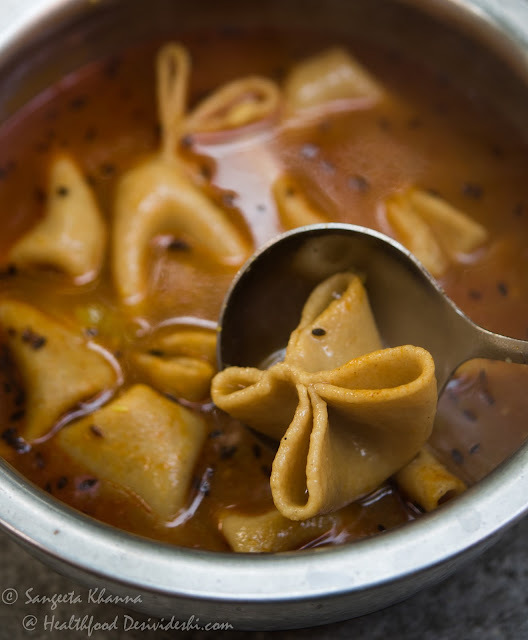 Dal ki dulhan is a name that comes from the specific shape of the dumplings that looks like the veil of a bride. The shaping of the dumplings can be different and the name of the dish also changes accordingly. It is called dal pithi when the dumplings are shaped like small discs or Orecchiette pasta. If the dumplings are stuffed it is called dal ka dulha. 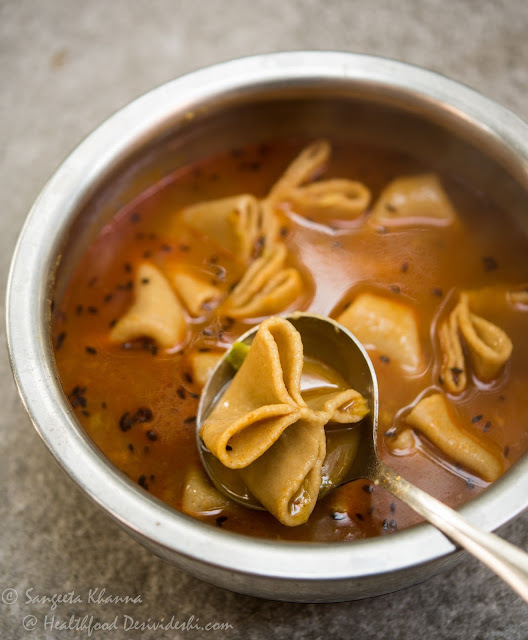 Similar recipes of lentil soups with dumplings made of whole wheat or chickpea flour are called as Varan phal or dal dhokli in Maharashtra and Gujrat respectively. I have heard from my friends from Maharashtra and Gujrat how favourite this dish is in their homes too. I think the beauty of this one pot meal lies in its simplicity. But all simple dishes can be a little tricky to master if you trust my experience. 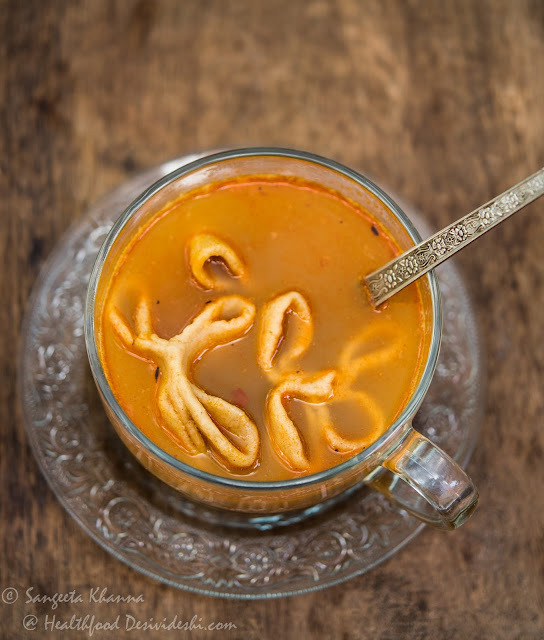 There are very few ingredients and very few steps involved in this recipe of dal ki dulhan but you miss a single ingredient or a single step and the result may be not so favourable. The dal ki dulhan should be cooked slowly to achieve a nice glutinous bite that the dumplings acquire, the dal should be thin and soupy so it gives a perfect base to the plain dumplings. The tadka you can choose the way you like but don't meddle with the cooking time or consistency of the dal. Without further ado, let me share the recipe so you can make it at home for your next meal. Mix all the ingredients for dal with 1.5 cups of water and pressure cook till done. If you are cooking dal for the first time, note that it takes about 10 minutes after the first whistle. Let the pressure cooker cool down before opening the lid. If cooking in a pan the dal takes about 35 minutes to cook. Meanwhile divide the dough into 20 small balls and roll each ball just like thin pooris. Keep them dusted with flour so they don't stick together. Open the pressure cooker lid and mix the dal. It should be smooth and thin just like soup. Add a cup of water and simmer on low heat. Shape the dumplings one by one and slip into the simmering dal. To shape the dumplings into dal ki dulhan, lift from four corners and join them in the center so 4 loops are formed taking a butterfly shape. Don't worry if you can't shape the dumplings perfectly as it wont affect the taste. Once all the dumplings are in the dal soup let it simmer for 15-20 minutes, the time depends on how thin the dumplings are. If you have rolled them too thin they will be read in 5-7 minutes. I used mixed grain flour to make the dumplings hence they took longer to cook. Adjust consistency and seasoning while the dal soup simmers, it thickens after the dumplings are added. Prepare a tadka by heating the ghee in a ladle (or tadke pan). Add hing and cumin seeds to hot ghee and let it splutter. Take the ladle off the flame. Add the chilli powder, mix and pour this tadka immediately into the simmering dal ki dulhan. Serve in soup mugs as a meal. No need to garnish but a spring on coriander leaves wont hurt. The simplicity of such a one pot meal remains in the no fuss no garnish approach. This is one dish you would find yourself slurping gleefully, may be with an extra dollop of ghee on top if you are like me. Yes, there are a few people who are not too fond of dal ki dulhan or dal ki pithi as much as I am. But recently when I made this dish in the kitchen of ITC Maurya where I am curating a food festival of Banaras cuisine, this dal ki dulhan found eager fans and it was loved by all. The food festival about the Ganga Jmuni tehzeeb of Banaras is being hosted at The Pavilion at ITC Maurya, from 9th of December to 18th of December and my partner in crime this time is a noted historian Ms. Rana Safvi who brings in some delectable food from the kitchens of her maternal grandmother. Rana's paternal grandparents were from Ramnagar, the satellite town of Banaras and we are looking forward to a great jugalbandi of our sister cuisines. The dal ka dulha is cooked the same way but the dumplings are stuffed with a urad dal peethi (spiced mix) before simmering in the dal soup. We will be serving the dal ki dulhan and dal ka dulha both at ITC Maurya. I will share more details really soon. Watch out this space. This recipe sounds quite easy and the dish looks tempting. I am always up for trying out such healthy amd quick recipes Thank you so much for penning this down.